Rick leads CutTime Simfonica for a packed room at Lake George. Wow! It has been three long months since I wrote to you. I hope your summer was delightful. Although the pace of CutTime's progress was slow this summer, I've been endlessly reading, writing and meeting, emails, social media, applications and people trying to solve this puzzle. Despite early private donations, our efforts have so far failed to match a $30,000 grant from the John S. and James L. Knight Foundation, as part of its Knight Arts Challenge, to expand the Classical Revolution Detroit series (CRD), now in its fourth year. We were given an extension past the September 1st deadline, but unless we move the needle past the current $11,000, we will lose the funding that can turn club classical innovation into something real and profound for all Detroiters! Project donations can be made online here. We are launching a Kickstarter campaign for $5,000 next month, trying some back channels into some local foundations, enlisting powerful new allies in the fight for classical music, and planning a fundraising luncheon-showcase in November. You will be notified of public opportunities. Meanwhile, our few summer events included a Campus Martius show and a short house concert for DSO Musical Feasts, standing in stark contrast to the previous summer's exciting weekly series. Monthly CRD events continued with growing participation and lately some quality ensembles. The next one is this Tuesday, September 23rd, 8pm at our Eastside home, the Cadieux Cafe. The highlight this summer was certainly our 3rd annual residency with the Lake George Music Festival in upstate New York. This year we featured four ensembles in the Art Attack series (video) despite some rainy weather. 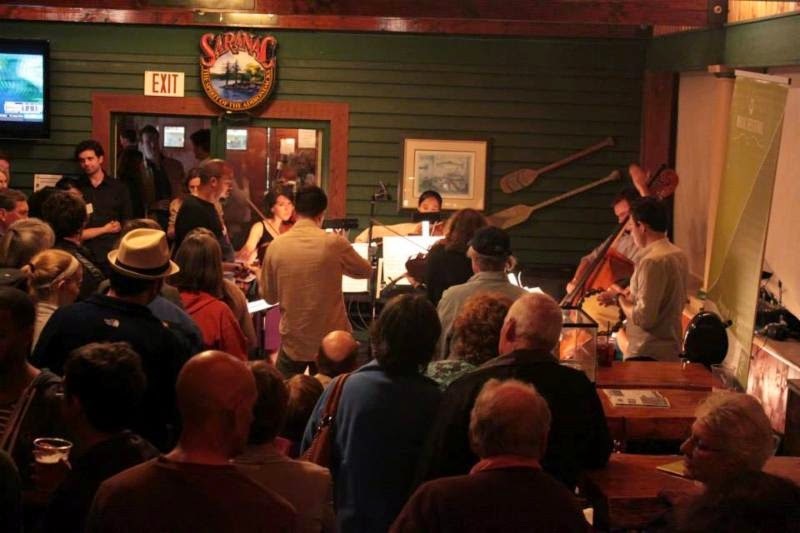 We also had four ensembles participate in the Late Night event to PACK The Boathouse Restaurant, with CutTime Simfonica setting the bar high (pictured at top). Plus we had a magnificent performance of the Introduction to Mighty Love that had everyone singing on the way out. We also facilitated a musician party on the lake with our host family that has become an annual tradition. It was also around this time that CutTime became a sponsored project of Fractured Atlas, a New York 501(c)3. This lets CutTime solicit and receive tax-deductible donations as well as apply for a few grants for our ongoing artistic and charitable operations (but not the Knight Project). Although the summer was disappointing with so few gigs, I did work out quite a bit and feel much healthier. Now that Fall has arrived, I have a number of concerts and events to share, the bulk of which are on the website calendar. My favorite is not even a CutTime concert, but a premiere of my new orchestration of Pork 'n Beans (A DE-troit Counterpoint) on November 8 by the Michigan Philharmonic at the Village Theater in Plymouth-Canton. This expansion is the start of my promise to fully orchestrate my works developed with CutTime Simfonica. Here you'll find more counterpoints, more power and more surprises with classical music. A recording may eventually become available online. The Ford House. We're also talking about a long-term project, loosely adapting The Soldier's Tale for Detroit students with the help of a major foundation grant. Wish us luck. Next week CutTime heads down to Raleigh-Durham, NC so Simfonica can help artistically launch the students (and parents) of an El Sistema program there. On the way I'll meet up with a pianist with similar ideas for new audience, a conductor who purchases my retail symphony transcriptions, and a class of beginning violin students in Greensboro. More CutTime news is coming next month. So if your autumn is having a great start, just sit tight, enjoy the music at cuttime.com and we'll get back to you soon with more ways we are going to cut loose with classical for new audiences. Remember that NOW is the best time to book CutTime Players for your company Christmas parties.